High-school textbooks too often gloss over the American government’s oppression of racial minorities. Earlier this month, McGraw Hill found itself at the center of some rather embarrassing press after a photo showing a page from one of its high-school world-geography textbooks was disseminated on social media. 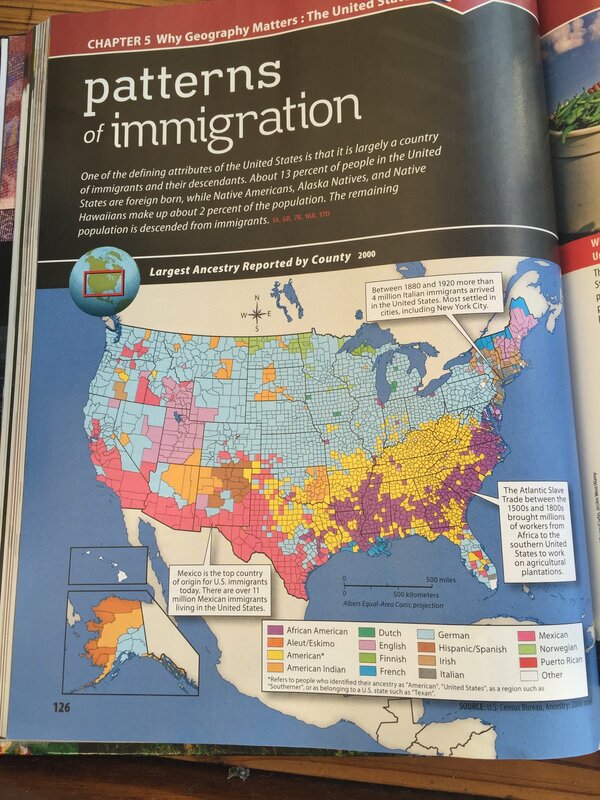 The page features a seemingly innocuous polychromatic map of the United States, broken up into thousands of counties, as part of a lesson on the country’s immigration patterns: Different colors correspond with various ancestral groups, and the color assigned to each county indicates its largest ethnic representation. The page is scarce on words aside from an introductory summary and three text bubbles explaining specific trends—for example, that Mexico accounts for the largest share of U.S. immigrants today. McGraw Hill swiftly did its damage control. It announced that it was changing the caption in both the digital and print versions to characterize the migration accurately as a “forced” diaspora of slaves: “We conducted a close review of the content and agree that our language in that caption did not adequately convey that Africans were both forced into migration and to labor against their will as slaves,” the company said in a statement. “We believe we can do better.” Catherine Mathis, the company’s spokeswoman, also emphasized that the textbook accurately referred to the slave trade and its brutality in more than a dozen other instances. And McGraw Hill has offered to provide various additional resources to any school that requests them, including supplemental materials on cultural competency, replacement textbooks, or stickers with a corrected caption to place over the erroneous one. But Texas school districts were already in possession of more than 100,000 copies of the book, while another 40,000, according to Mathis, are in schools in other states across the country. Currently, most students learn history as a set narrative—a process that reinforces the mistaken idea that the past can be synthesized into a single, standardized chronicle of several hundred pages. This teaching pretends that there is a uniform collective story, which is akin to saying everyone remembers events the same. Yet, history is anything but agreeable. It is not a collection of facts deemed to be “official” by scholars on high. It is a collection of historians exchanging different, often conflicting analyses. And rather than vainly seeking to transcend the inevitable clash of memories, American students would be better served by descending into the bog of conflict and learning the many "histories" that compose the American national story. In fact, of the 11 subjects—which include the arts, several foreign languages, and natural science—history has seen the largest decline in the percentage of teachers with postsecondary degrees between 2004 and 2012. And it seems that much of the problem has little to do with money: The federal government has already dedicated more than $1 billion over the last decade to developing quality U.S.-history teachers, the largest influx of funding ever, with limited overall results. That’s in part because preparation and licensing policies for teachers vary so much from state to state. A recent report from the National History Education Clearinghouse revealed a patchwork of training and certification requirements across the country: Only 17 or so states make college course hours in history a criterion for certification, and no state requires history-teacher candidates to have a major or minor in history in order to teach it. And as the McGraw Hill example demonstrates, the textbooks teachers rely on so heavily are prone to flaws. A National Clearinghouse on History Education research brief on four popular elementary and middle-school textbooks concluded that the materials “left out or misordered the cause and consequence of historical events and frequently failed to highlight main ideas.” And the flaws can be much more egregious than isolated errors, disorganization, or a lack of clarity—sometimes they’re fundamental distortions of the contexts leading up to many of today’s most dire social ills. Take the Civil War. As Loewen argued in a recent Washington Post op-ed, textbook publishers tend to “mystify” the reasons for the South’s secession largely “because they don’t want to offend school districts and thereby lose sales.” Some of the most widely used history textbooks today even insinuate that the South’s motivation for secession was simply to protect states’ rights—not to preserve slavery. And this “mystification” can come with significant societal implications. As The Atlantic’s Ta-Nehisi Coates has pointed out, Americans still disagree about “What This Cruel War Was Over.” A recent national poll found that while 54 percent of Americans identify slavery as the cause, 41 percent do not; beliefs over what schools should teach children about the cause mirror that distribution. Perhaps these realities help explain why racial achievement gaps are so large in social-studies subjects—comparable to the divide in math, a subject notorious for socioeconomic disparities in proficiency. One of the largest gaps is in geography, which saw a 33-point difference between black and white eighth-graders’ average scores on the 2013 National Assessment of Educational Progress (NAEP); the difference between Hispanic and white students was 25 points. But the gap was also notably large on the 2013 U.S. history and civics exams, too. These disparities aren’t likely to improve, considering how No Child Left Behind has reduced the time dedicated to social-studies instruction nationwide—a concern highlighted just last week in a report published by the U.S. Government Accountability Office. Meanwhile, the last year alone has witnessed an array of clashes over history education. There’s the recent (and ongoing) battle over the AP U.S.-history curriculum, which has become embroiled in a tug-of-war between those who say it’s too patriotic and others who say it isn’t patriotic enough. Similar debates have taken place over the teaching of civics—and, in particular, over one group’s effort to make the U.S. citizenship exam a high-school graduation requirement in every state. And this summer, Dylann Roof’s massacre of nine African Americans in a Charleston church—and the concerns subsequently raised about the persistence of white supremacy and ideologies symbolized by the Confederate Flag—renewed conversations about the distorted ways in which the history of slavery is taught in so many of America’s schools. A consistent point of tension across all these examples is whether history classes and their accompanying texts are misleading kids with Eurocentric interpretations of the actors and events that have shaped the human experience. “Research finds that the overwhelming dominance of Euro-American perspectives leads many students to disengage from academic learning,” wrote the author and teacher Christine Sleeter in a 2011 report promoting the academic and social benefits of teaching ethnic studies in schools. And it’s not just the black-white dichotomy that’s driving these controversies, of course. Tucson, Arizona, remains caught at the center of a legal battle over the state’s ban on a Mexican American Studies class—a clash that’s helped fuel a movement to bring ethnic studies into schools across the country. And in a piece for The Atlantic last week, Melinda Anderson wrote that some schools have started to teach children a more nuanced version of Christopher Columbus’s role in America’s founding. This, again, is where historiography comes in. “Historiography asks us to scrutinize how a given piece of history came to be written,” wrote Loewen in his introduction to the The Confederate and Neo-Confederate Reader: The “Great Truth” About the “Lost Cause,” a compilation and analysis of primary-source documents related to the Civil War. “Who wrote it? When? With whom were they in debate? What were they trying to prove? Who didn’t write it? What points of view were omitted?” The importance of historiography, Loewen argued, is especially evident when it comes to teaching about the Civil War. In his workshops with teachers—and not just those in the South—Loewen regularly found that small percentages identified slavery as the reason for the Civil War. “Most teachers continue to present and misrepresent this issue to the next generation of Americans … Most of them had been presenting an untrue version of why the South seceded” he wrote in the Reader, “because they didn’t know the key documents.” These documents, which include the declarations of the 11 Confederate states marking their departure from the union and speeches like the one Henry Benning gave to the Virginia Convention, rarely get much, if any, play in mainstream history textbooks because it’s risky. But the risks that come with such “erasure,” as Roni-Dean Burren would put it, are even greater. In this animated interview, Ta-Nehisi Coates explores how mass incarceration has affected African Americans throughout U.S. history.